Nicola Benz’s practice is focused on technology and life sciences transactions. She assists technology companies of all sizes, from start-ups to established players, as well as investors, suppliers and customers across a broad range of industries and sectors. Nicola Benz’s expertise covers outsourcing, licensing, joint ventures and collaborations and associated intellectual property issues. She also has considerable experience advising on all types of commercial contracts, competition and regulatory issues and data protection. Nicola Benz is recognised as a globally leading patent and technology licensing lawyer, as well as a leading practitioner in the field of intellectual property. Chambers Europe (2018) ranked her as leader in the fields of Intellectual Property and Life Science, and she was recommended in the 2017 edition of the Legal 500 EMEA for Intellectual Property as well as TMT matters. She has also been named as a thought leader for data law in the publication “Who’s Who Legal 2018”. Born in Scotland, Nicola Benz obtained her law degree from the University of Edinburgh (LLB Hons) in 1997. She joined our firm as an associate in 2002 and became a partner in 2010. Since 2017 she has been the managing partner of our firm. Her working languages are English and German. 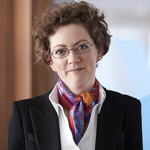 Nicola Benz is a member of the Zurich Bar Association, the International Trademark Association (INTA), the Licensing Executives Society (LES) and the International Technology Law Association (iTechLaw).